Leather sofas and furniture including chairs and recliners have really taken off. They all need cleaning, so where do you find a Leather sofa cleaner Doncaster. Leather upholstery is a big investment and you want to get the very best from it. The best way to do this is to deep clean once a year and in between use a suitable conditioner and finisher. We supply the exact match for your leather sofa, so you don’t have to worry about using something from the supermarket that will damage your leather sofa. We are a very experienced and highly trained Doncaster family firm and we can deal with all types of leather. This includes Antique Leather, Aniline Leather, Semi Aniline Leather, Nubuck, Pigmented Leather and suede. Don’t worry, we will be able to identify what type you have when we carry out our free leather sofa cleaning survey. 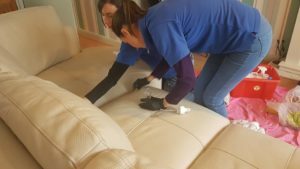 No matter what sort of leather your sofa is made of it does need to be kept clean and needs to be treated or re finished at least once a year. You may have been told by the furniture sales person that it just needs a quick wipe down with a leather wipe. Or even that it needs no cleaning at all. This is utter nonsense! Your leather sofa and upholstery is in constant use. It will become dull and tired looking. It picks up dirt like any other material. Your sofa is screaming at you to get it deep cleaned and re finished, before it gives up and starts to crack. At this point you should call a leather sofa cleaner Doncaster to bring it back to it’s former glory. You may even want a complete colour change. Black to white? Yes we can do that too.